President Obama’s best chance for turning around the economy is to make sure that Paul Volcker, Federal Reserve Chairman prior to Greenspan, is in charge of needed economic reforms. Although Tim Geitner showed promise when nominated Treasury Secretary, he looked more like Michael (Katrina) Brown than a competent leader in his first press conference. He may indeed be nothing more than a figure head for unregulated hedge and private equity funds. After all, the Chairman of the New York Federal Reserve Bank– where Geitner came from– was formerly with Goldman Sachs, and now works for a leading private equity fund. Geitner actually proposed that these unregulated hedge and private equity funds could be a key part of the solution to the current financial mess, a mess they created. While Volcker is calling for immediate registration of hedge and private equity funds with the SEC, Geitner and Summers, both of whom have strong ties to these funds, are silent on the issue. One has to ask how long the markets, in particular the equity markets, will wait for transparency and integrity to be restored before sending a strong message to President Obama. Below is an excerpt from a Bloomberg article summarizing Volcker’s concerns with respect to Summers and Geitner’s inaction. This week TD Ameritrade held its annual institutional advisor conference at Cesar’s Palace in Las Vegas. CEO Fred Tomczyk, pictured on left below, summarized TD’s strong financial position in addition to his belief that money market accounts should be about safety and stability. For this reason, TD has chosen to minimize both duration and credit risk in these accounts. Tomczyk is clearly the right person to be leading TD Ameritrade. Tom Bradley, pictured on right below, leads the institutional area and was instrumental in successfully advocating against the Merrill Lynch brokerage exemption rule, a rule which allowed investment professionals to avoid registration with either the state or SEC. It is now up to the SEC to take action regarding this rule which has led to such widespread abuse. I asked the first question of Tom after his presentation. The question was, will TD Ameritrade now aggressively advocate that private equity and hedge funds be required to register with the SEC. This same question was asked of both Karl Rove and General Wesley Clark, in addition to whether or not they are personally invested in private equity or hedge funds. I will mention their responses below. My sense is that requiring hedge funds and private equity to be registered with the SEC is essential to restore transparency and investor confidence. Bradley responded that he is optimistic and sees the new SEC chair as a reasonable person but stopped short of committing to lead this much needed effort. Bradley also noted that the SEC has had difficulty regarding effective enforcement, as indicated by the $50 billion Madoff scandal that broke in December. In response to my question directly to Rove and Clark, Karl Rove said “I am too poor to invest in private equity and hedge funds,” but added that he thought that as long as these investors are large sophisticated investors, perhaps there is no need for registration. He added that if he were not speaking at the conference he would be hunting with T. Boone Pickens, one of the nations largest private equity investors. Pickens spoke the previous day and noted he had lunch with President Bush that week, a lunch Bush requested. Pickens added that Bush asked him straight out, “Boone do you understand all this stuff Wall Street has created.” Pickens replied, I am a geologist and have no idea what they were doing. What neither Rove or Bush seem to realize is that the biggest investors in these hedge and private equity funds are now tax exempt public pensions, endowments and foundations. What this means is that teachers, janitors and college students financial futures are directly tied to these investment vehicles, making registration with the SEC imperative. Not to mention their interlocks to banks and their government insured deposits. Clark was articulate in his response, noting that elimination of the “uptick rule” had fueled short selling by hedge funds, perhaps adding to market volatility. He did not however answer the question regarding whether he was personally invested in such funds. Clark also cited the Bush administration as being lax in its regulatory responsibilities. Although perhaps true, Rove repeated several times that it was the Democrats who blocked the Bush administrations efforts to regulate Fannie Mae, a key catalyst to the current financial crisis. My overall take on the Rove Clark debate is that Rove overlays his economic philosophy with too much politics and not enough basic math, although he was certainly right on the Fannie Mae issue. Clark is a brilliant articulate leader, perhaps able to contribute to solving this mess, yet he is simply naive with respect to the impact of hedge and private equity funds. 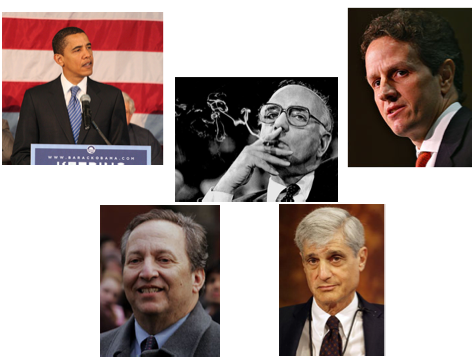 One thing is for sure and that is the increasing importance of Paul Volcker to the Obama administration. 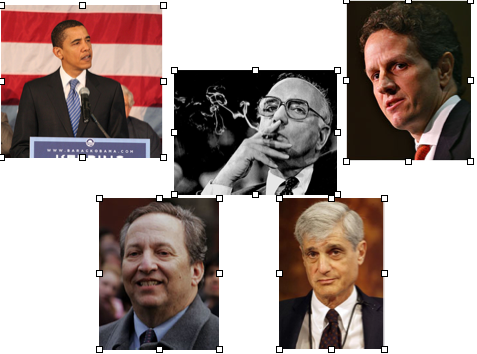 Volcker appears to be the only visible leader who truly “gets” what is needed to stabilize the system. Pictured below is a photo of Rove and Clark responding to my question. William Poole, pictured below, was also keynote speaker. His presentation was superb, yet like many distinguished economists he is handicapped by not understanding accounting and taxation. His perspective seemed to be that free market solutions are always best and did not seem to understand the importance of adequate disclosure to generate transparency and related investor confidence. I asked Poole after his presentation if he supported hedge and private equity funds being required to register with the SEC and he replied no because they might just move to London. He clearly has no grasp regarding the significance of this vast shadow banking system and how it has destabilized our economic system. Such funds are now receiving most of their funding from US based public pensions and endowments and therefore the SEC or another government regulator clearly has the leverage to generate this needed oversight. It is not likely that these funds will abandon their funding sources. On January 31st I posted a brief video on youtube summarizing a program in which the Oregon Investment Council is lending its securities portfolios, using State Street as an intermediary, to hedge funds and private equity firms so that they may meet the ownership standards required to conduct short selling– betting on the declines of stocks. The video can be seen by searching for Bill Parish Public at youtube.com or by following this link: Public Pensions Fuel Short Selling. Below is the Agenda, note this was for January 2009, it mistakenly lists Jan 2008, highlighting the review of this program in addition to a photo of Tom Motley, the representative from State Street in charge of Security Lending. It is somewhat astonishing that these hedge and private equity firms are therefore profiting on the decline of the very same securities owned by the Oregon Investment Council. Clearly, the lending of securities owned by public pensions should be banned immediately by the Obama administration. While short selling may be an important part of the overall market, the notion that right of ownership can be lent for the purpose of such investments is simply ridiculous, no matter how long it has gone on. A link to this video was also sent to several leading journalists and today the Wall Street Journal printed a story today regarding AIG’s security lending portfolio. Although AIG’s program is different in detail, the same overall concept is used. That is, AIG was lending its right of ownership to others so they could engage in transactions which regulators would otherwise prohibit. On November 18, 2008 I gave a presentation to the local chapter of the American Association of Individual Investors (AAII) at the Multnomah Athletic Club here in Portland, Oregon regarding the overall state of the financial markets. The talk focused on how we arrived where we are and what to look for going forward. Also included were what I believe to be the six most important regulatory reforms– all of which could be implemented immediately– that would collectively turn around the economy. 1) Requirement that hedge and private equity firms register with the SEC and disclose their top 25 holdings, top 25 sources of funding and key accounting policies on a quarterly basis. 2) Expanded oversight of bond rating agencies and requirement that Warren Buffett and other investors who do significant business with these rating agencies divest themselves of equity positions in the same rating agencies. Buffett is currently Moody’s largest shareholder. 3) Provide the SEC with oversight of public pensions, now the nation’s largest investment pools. They currently have no jurisdiction or oversight over such funds, which is simply astonishing given their growth and related impact on the market. 4) Expanded oversight of proxy firms and development of new competitors in this crucial area. Currently one firm, Institutional Shareholder Services (ISS), has a monopoly over the market. ISS is owned by Risk Metrics, a company that recently went public, whose primary owners are unregulated hedge funds. It is unthinkable that unregulated hedge funds would hold the levers over the most important entity with respect to corporate governance, the entity that votes key corporate resolutions for many leading fund managers regarding mergers, executive compensation, etc. 5) Stock option accounting must be standardized and based upon values captured when such options are exercised rather than using arcane math formulas and related assumptions. This is simple but has been bitterly fought against by the technology industry, most notably John Chambers of Cisco Systems. Microsoft has provided the leadership when it terminated its stock option program in 2003, it now provides restricted stock that vests 20 percent each year and whose cost is fully accounted for. 6) Reform the tax code to prohibit net operating losses (nol’s) from being aggregated and used to purchase profitable companies and avoid taxation. Such losses should be amortized over 15 years, as is the case when profitable companies purchase other companies with operating losses. Such amortization was created when a loophole was closed in the 1980’s due to a public outcry, the closure was led by then Republican Senate Finance Chairman Bob Packwood of Oregon. Packwood and others never conceived that the loophole would be worked in reverse to escape the reform, that is someone aggregating losses and rolling in profitable companies. Closing this loophole will slow down mergers that make no economic sense and preserve millions of jobs that would otherwise be lost for no sound economic reason other than a few managers leveraging growth in their stock options for short term gain. This week Bloomberg disclosed that Warren Buffett, the man who has called derivatives a weapon of mass destruction, has himself afterall leveraged his fund Berkshire Hathaway by making a $40 billion bet in derivatives. Little known to most investors is that Buffett’s primary source of revenue is his 50 insurance companies, including General RE, his company in which top executives are going to jail for accounting fraud associated with transactions involving AIG. The derivaties revelation was accompanied by a sharp drop in the fund price and the downgrading of Berkshire Hathaway bonds. It is probably also time that Buffett divest himself of Moody’s, he is the bond rating company’s largest shareholder. Moody’s played the key role in the subprime mortgage debacle and later claimed that it mistakenly overrated subprime debt due to a computer error. It has been a tough month for Buffett in which the old expression “walk the walk” comes to mind. On Friday President Elect Obama designated Tim Geithner to be the next Treasury Secretary and the stock market rose roughly 5 percent in minutes. Clearly, this was former Federal Reserve Chairman Paul Volcker’s choice and once again demonstrates Volcker’s influence as a beacon of integrity and competence. It also highlights Obama’s good judgement by seeking out and relying on the best advice, i.e. Volcker. Equally important was the decision to safely distance Larry Summers, designated to lead the Council of Economic Advisors, from the key operational decisions that require the competence and grounding of someone like Geithner. Also critical was to exclude former Treasury Secretary Rubin, known as the Godfather of hedge funds within the industry. Yet to be made is the critical decision regarding who will be the next Chairman of the Securities and Exchange Commission (SEC), a role only second in importance to the Treasury Secretary. What is clearly needed is an aggressive regulator focused upon restoring investor confidence.